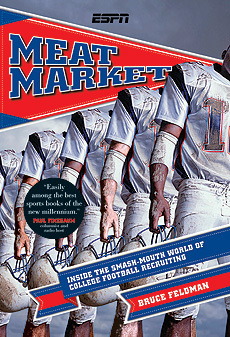 The premise of Meat Market allows the reader to find out “What really happens behind closed doors of a college football program’s war room?” The book shows exactly what goes through college coaches minds every step of the way through the recruiting process. Meat Market follows Ed Orgeron and the Ole Miss football staff along the recruiting trail for an entire year as the Rebels try to evaluate and woo prospects for their program. For Orgeron, the ace recruiter who helped build USC back into a powerhouse just a few years earlier, times had changed. Instead of selling an elite program on top of college football, he was touting a second-tier operation in the game’s toughest conference, the SEC. The Rebels’ biggest target for the Class of 2007 turns out to be a dynamic speedster from Louisiana named Joe McKnight who the Ole Miss coaches have had their sights on for three years. Of course, everyone else loves McKnight too. Even Orgeron’s old school, USC. And that drama would just be one of many odd twists in the roller coaster ride to Signing Day. "A jaw-dropping book. Bruce Feldman is the John Feinstein of his generation. He has gotten inside and gained access to this complex subject better than any sportswriter in memory. Meat Market is easily among the best sports books of the new millennium. Not only was it engaging, it was at times hilarious and frightening, seeing what really happens in the bowels of recruiting. This is must-reading for any college football fan. I don't know when I have enjoyed a book more or been unable to put one down. This book absolutely blew me away." "Recruiting is the lifeblood of college football yet is the most mysterious, misunderstood aspect of the sport. Feldman opens doors and opens eyes in a revealing look at how the machine that drives college football really works. Playing the big boys on the field is one thing. For those outside the "traditional power" fraternity, Meat Market shows that recruiting against them is even tougher . . . even for a Red Bull powered recruiting maniac like Ed Orgeron." "Bruce Feldman has recorded the most detailed account of a recruiting season I've read. You are taken behind the curtain of a program hungry to reach the elite and provided a revealing, fascinating look at one of college football's unique characters, Coach “O”." "What serious football fan wouldn't love to be a fly on the wall in the recruiting war room of a major college program? Feldman got to do just that, delivering a fascinating first-hand account of all the dizzying phone calls, late-night film sessions, frantic road trips, and paranoid parents that went into the Ole Miss coaching staff's pursuit of a recruiting class."